PADI Bubblemaker: Bubblemaker is as fun as it sounds – This course is a student’s first introduction to scuba diving – a chance for kids to blow bubbles. Students can use scuba gear to breathe underwater and swim around in shallow water. Bubblemakers will get a chance to experience scuba diving under the direct care and supervision of an instructor and take their first breaths underwater, shallower than 6 feet. 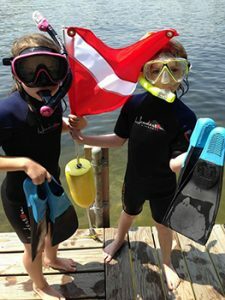 They will learn about scuba diving equipment made for children, not adults and have lots of fun! The two-hour session includes a small classroom session, gear workshop and pool time.